We all know by now that I'm a Monet fan. So much so, that Monet has his own little magnetboard exhibit at home. Here's my own little Monet mosaic, I suppose. Many years ago, on a roadtrip out to Newport, RI, a friend and I did the Cliff Walk, and she took this picture of me. Ever since, it's been my most favoritest picture of me - ever. It's basically me, against the world. Anyway, if you look at the second magnet in from the left on the bottom row, you'll see my most favoritest Monet - ever. 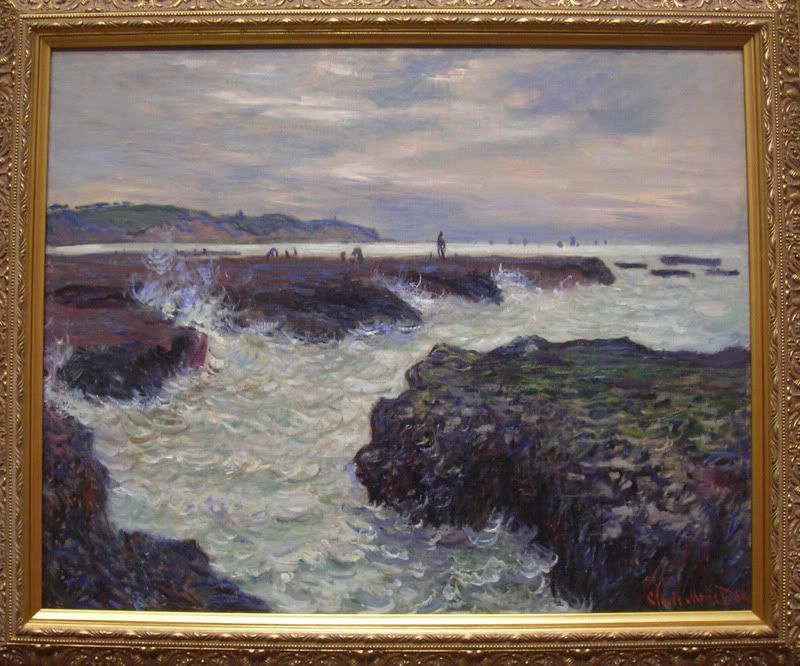 It's Rocks at Pourville, Low Tide, 1882. 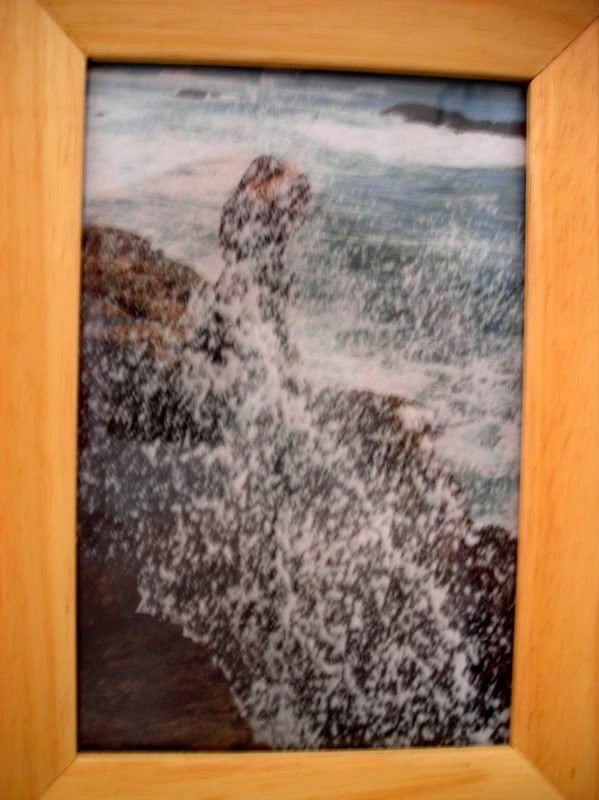 The two images look a little alike - the hazy little person at the center, and the waves crashing against the cliffy rocks. And I love the bluesy-purply color palette, not often found in Monet's work. And so began my quest to see the painting in person. I had first seen this as part of an Impressionists screensaver, back when people were still downloading fun screensavers. (Remember Flying Toast?) I tried researching everywhere, contacting curators about it, and every so often, doing a generic Google search. On a couple of leads, I had almost booked tickets to Birmingham, AL, and Maine to visit their art museums. Then, I became obsessed with what if it was in the State Hermitage Museum in St. Petersburg, Russia. But to no avail. After a while, my search lessened, and I happened to mention my silly Quest for the Monet Grail on a message board...and within minutes, a friend of mine was like, "Ummm, I just saw that painting a couple of months ago at the Rochester Museum of Art." This whole time, the painting's been in my backyard! And, so, off I went. I had a similar quest at one point--in 8th grade I heard someone sing "On My Own" from Les Mis in a talent competition, and loved the song, but couldn't remember any lyrics afterward and I'm such a horrendous singer my attempts at the melody were unrecognizable to everyone else. I had no idea what the song was until I saw Les Mis my junior year in high school and--WHOA! There's my song!! My family thought I was crazy because I started silently flipping out in the theater. Took me three years, but I found it... and on a night I wasn't even trying! That's a great story, though. I can't even imagine trying to sing that for someone and them getting what I'm singing. Hee! I remember that day, when you said that you had been looking for that painting. I recognized the photo immediately and thought "are ya kidding me? What is this, some weird cosmic prank?" Who do thunk that your painting was stuck up here in the boondocks? My quest centered on a brass quintet piece we played in high school. I had a cassette tape of it, labeled only "Scherzo" with no composer. Tracking it down would have been such a pain, finding a brass expert, or maybe a classical radio station. Years later, in the Internet days, I went googling for "brass quintet scherzo", found a few links, and voila--there was an audio sample of this very piece. Oh, technology, how I love you. Seriously. What would we do without Google search. I must confess to never remembering the titles of a lot of the piano and band pieces I've played. So every once in a while, in a random elevator or store, or just riding in the car flipping stations, I suddenly find myself humming to the music. And still not knowing what I'm humming. Heh. Oh, also, thanks for finding my Monet! Next stop. NYC 2012. Ok, ok. Fine. London 2012. It's not Fandango's fault, I suppose. There's always room for Jell-O!